The purpose of diversification is to lower the risk of an investment portfolio, while at the same time not reducing the expected returns. Economics Nobel Prize winner Harry Markowitz once said… “Diversification is the only free lunch in finance”. This is a true statement. Dramatically lowering a portfolio’s risk while delivering equivalent returns…you must take that deal. Diversification is the most powerful portfolio management tool an investor has to successfully and efficiently grow wealth over the long-term. However, just like the real cost of a free lunch, not all forms of diversification create equivalent value. Imagine a free lunch at a McDonalds versus a five-star restaurant. Designing a portfolio using the most advanced techniques of diversification makes it possible to reduce the risk of an otherwise similar portfolio in more than half, while maintaining the same expected returns. Dramatic risk reduction at no cost in expected returns is the institutional edge you hear us at 3Summit speak about regularly. This Investing Insight explains how advanced diversification techniques differ from the most commonly used conventional diversification methods. We are comfortable to openly discuss our diversification and portfolio management methods because no investing topic is more important to our readers’ long-term investing success than understanding risk management. Before we explain the advanced risk management process 3Summit uses that we call Multi-Dimensional Diversification, it helps to define portfolio risk and how it is measured. The primary risks a portfolio faces are volatility and large losses. Volatility is the measure of how much a portfolio’s value tends to rise and fall over time. A portfolio with a high volatility involves high risk because the more a portfolio’s value tends to swing up and down, the greater the probability that the portfolio will experience large losses at some time in the future. The tendency for a portfolio to generate large losses is measured by calculating what is called portfolio drawdown; really this is just another term for the measurement of portfolio losses over time. These measures of risk are so important because wealth is most efficiently multiplied by preventing large losses over an investor’s lifetime. So many investors are solely focused on the returns of their portfolio, when the success an investor will have in growing their wealth over time is most easily predicted by evaluating and managing the total risk taken to earn those returns. Frankly, preventing large losses is more important than generating high returns. This is because of how difficult it is to recover from losses. Losses are the most powerful force influencing how effectively a portfolio grows over the long-term. 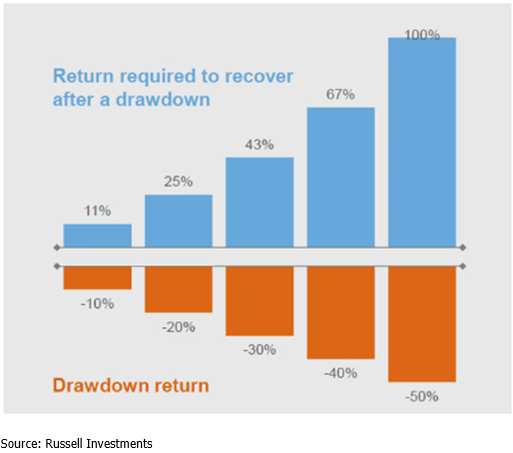 As the size of a loss (drawdown) increases, the returns required to recover from that loss grows exponentially with the size of the loss. The chart below demonstrates this fact. Proper diversification is the most powerful tool to prevent a portfolio from experiencing large losses. At the height of the financial crisis in 2009, U.S. stocks lost more than 50% of their value. The chart above illustrates how an investor that was only invested in U.S. stocks during 2008 and 2009 experienced a 50% loss and would have had to generate investment returns of over 100% just to get back to even! A recovery of that size took years. That is assuming the investor had not panicked and taken their money out of stocks, in which case they still might not have recovered back to even almost ten year later. Losses inflict double damage: first the loss of wealth; and second, the cost of missed opportunities to grow wealth while a portfolio recovers from losses. All portfolio managers say they utilize diversification. Some say that investing a portfolio in 60% stocks, and 40% fixed income is diversification. Others say they introduce diversification within stocks by investing in many different individual stocks within different sectors of the stock market: industrials, financials, energy and so forth. Understanding how diversification lowers risk in a portfolio is easiest when you think of applying diversification in distinct layers. Each source of diversification is a separate layer and when an additional layer of diversification is added to a portfolio it provides added benefits by lowering the total portfolio risk. The most basic example to help understand how a layer of diversification lowers risk is looking at a portfolio with a single stock. Individual stocks can be among the riskiest investments on their own. While an individual stock tends to move with the overall market of similar stocks most of the time, each stock is susceptible to increasing or decreasing in value much more than the overall market because of independent events unique to that single stock. For example, a company may report large unexpected losses causing the stock to fall dramatically. However, the risk of owning a stock can be reduced by buying additional stocks. Even though each stock you add could be as risky as the first, with each additional stock you add to a portfolio, you are reducing risk because it is unlikely that all the stocks in the portfolio will be dramatically impacted by unique independent events at the same time. Therefore, with each added stock the portfolio begins to move closer to behaving like the total market of similar stocks and less like any single stock in the portfolio. This example of investing in many stocks instead of a single stock is ONE layer of diversification that adds benefit to the portfolio by lowering the total risk of the portfolio. To further reduce the risk of a portfolio you can add additional layers of unique sources of diversification. In general, most individuals are invested in portfolios which apply conventional diversification consisting of two or three unique layers of diversification. These layers include asset class diversification, meaning they invest in more than one type of security like stocks and bonds. Some conventional portfolios include regional diversification in that they invest in securities outside the United States. The final layer is security diversification which we previously explained as investing in more than one security within each asset class. Conventional portfolios succeed in lowering risk, but the amount of risk that can be mitigated is limited. 3Summit uses what we call Multi-Dimensional Diversification. It includes five unique layers of diversification. The two additional layers shown above include economic and sources of returns diversification which we will explore in detail shortly. A portfolio with Multi-Dimensional Diversification is so effective at decreasing portfolio risk because these two additional layers are the most impactful in the diversification benefit they provide a portfolio. Additionally, a multi-dimensional portfolio enjoys a superior portfolio structure, which increases the effectiveness of the three layers included in a conventional portfolio. The best way to demonstrate the differences between conventional and Multi-Dimensional Diversification is to look at the two in action using a hypothetical portfolio analysis. In this hypothetical analysis the conventional portfolio applied conventional diversification with 60 percent in global stocks and 40 percent in global bonds. 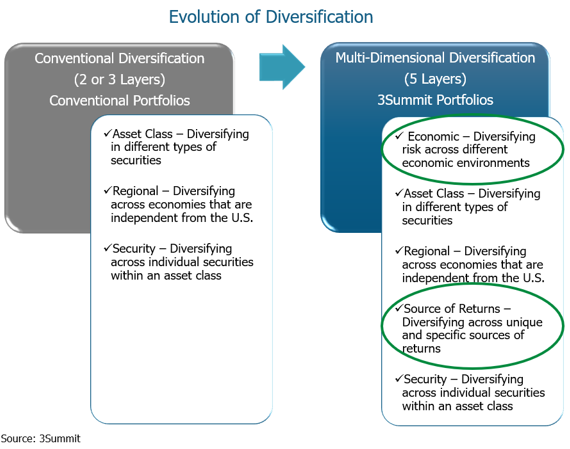 The multi-dimensional portfolio has similar allocations to stocks and bonds but applies the additional layers of diversification included in the diagram above. The differences are significant. The multi-dimensional portfolio did not sacrifice returns, in fact, during the period examined the portfolio had higher returns than the similarly allocated conventional portfolio while generating losses that where less than a third the size of the conventional portfolio! A portfolio just invested in the S&P 500 would have had a maximum loss of -50% during the period analyzed, conventional diversification with a maximum loss of -34% did reduce the total risk of a 100% stock portfolio. However, the multi-dimensional portfolio had a maximum loss of only -11% during the same period which is more than 2x less risk than the conventional portfolio and almost 4x less risk than 100% stocks. The chart below now shows the dramatic effects minimizing losses has on the accumulation of wealth over the period analyzed. The multi-dimensional portfolio generates much more wealth for the investor over the period we reviewed. The multi-dimensional portfolio generates such an advantage by losing ‘less money’ along the way which allows for the portfolio to much more efficiently benefit from compounding returns. In other words, because the risk of the portfolio is so much lower, the ride up is a lot less bumpy and therefore the portfolio growth is more consistent. Let’s also not forget the other important benefit of high quality diversification; an investor invested in the multi-dimensional portfolio only had to watch their portfolio fall about 11% during the financial crisis, where as a conventional portfolio investor using conventional diversification endured an almost 35% loss. This can mean the difference in having the tolerance to stay invested versus making the mistake of pulling your money out of the markets at the wrong time. In this final section I will explain how Multi-Dimensional Diversification expands on conventional diversification and in so doing, explain the powerful risk management methods developed over years of research by academics, institutional investment management firms and 3Summit. As I mentioned earlier, Multi-Dimensional Diversification is so effective at limiting risk without sacrificing returns because of the added layers of unique sources of diversification and because of a superior portfolio structure. I will go through each layer and explain how it contributes to reducing risk and how it is implemented in the real-world portfolios 3Summit manages for our clients. Asset class diversification is the process of adding different types of securities to a portfolio which are intrinsically different. For example, a stock is ownership in a specific company where a bond is a loan to a company or government. These are distinctly different types of investments and therefore tend to be impacted differently by economic forces. By adding both bonds and stocks to a portfolio, there is a natural reduction in risk because the portfolio is invested in distinctly different assets. The extent of the diversification and therefore risk reduction benefit of adding bonds to a stock portfolio depends on how correlated they are to each other. Correlation is the statistical measure of how two different assets values move in relationship to each other through time. If two assets are uncorrelated this means the values of the assets tend to move independently of one another. The more correlated or greater the tendency of assets to move together the less diversification benefit and therefore risk reduction that is achieved by including the two assets in a portfolio together. Economic diversification is the jet fuel of risk reduction and is the primary reason why multi-dimensional portfolios have historically succeeded in reducing the risk of a similar conventional portfolio, in some cases by more than half. The economic cycle (or business cycle) is the boom and bust cycle that markets have historically repeated through time. The key to preserving capital by limiting downside risk is designing portfolios that are diversified across the different economic environments caused by the economic cycle. Economic diversification is a different dimension of conventional diversification entirely and has the greatest impact on lowering a portfolios tendency to experience large losses. The reason economic diversification is so effective is because the economic cycle is the most significant economic force impacting the value of all securities. Economic diversification seeks to expose a portfolio to a consistent level of risk regardless of what phase of the economic cycle a market is in. The economic cycle has four primary economic phases, and each type of security reacts differently to each phase. 3Summit makes sure to include assets in portfolios that do well in each specific phase of the economic cycle. The weighting of those assets is designed to spread the risk as evenly as possible across the four economic phases so that the portfolio performs consistently regardless of what phase of the economic cycle the markets are in. Conventional portfolios do not consider the economic cycle, so they are exposed to certain phases heavily and not at all to other phases. This results in large drawdowns and higher volatility when the markets enter a phase where the conventional portfolio has no or immaterial exposure to assets that do well in that phase. Regional diversification means investing globally and not just in the United States. Regional diversification complements economic diversification because international economies operate independently of the U.S. economy and therefore have their own economic cycle. Independent economies are likely to be in different phases of their economic cycles at different times which enhances economic diversification. Conventional asset class diversification does not distinguish between assets that are merely different and those that generate unique sources of returns. Diversifying across different assets simply because they are different is not adequate because correlations of different asset classes tend to increase during times of economic stress, which limits their diversification benefit when a portfolio needs it the most. Sources of returns diversification is a major enhancement to conventional asset class diversification because it diversifies individual asset classes like stocks across many different sources of unique returns, which helps a portfolio generate more consistent returns over time. For example, many conventional portfolios invest in mutual funds that try to generate returns by picking many stocks the manager believes will do better than the market. The source of returns for mutual funds is stock selection (whether mutual funds are even a good source of returns is a debate for another letter). In this example, the portfolio is only invested in one source of returns which adds no diversification benefits and results in higher volatility. 3Summit manages many unique, high quality investment strategies that generally only institutional investors have access to. Investment strategies are designed to target specific and unique sources of returns in a very efficient, cost effective manner. While our strategies offer a major source of value for our clients, more importantly they allow us to include many strategies for each asset class which all seek unique sources of returns. This diversifies the source of returns for each asset class and can enhance returns and lower volatility. The inclusion of many strategies in each portfolio is what we call multi-strategy portfolios and they offer a tremendous portfolio structure advantage that further lowers risk. Individual security diversification is the most common form of diversification, and like conventional portfolios, multi-dimensional portfolios invest in many individual securities. Our investment strategies invest in ETF’s which invest in dozens, hundreds or even thousands of individual securities in cost effective ways. In future letters we will expand on the securities we use to accomplish adequate security diversification, how we select those securities and importantly how we manage portfolio expenses. The word “diversification” is too often used as a catch all buzz word in the investment management industry, frequently used as a one-word answer to how a manager manages investment risk. Diversification is complex and nuanced, and we hope this Investing Insight has shed some light on the pivotal role risk management has in ensuring you succeed in preserving capital and building wealth over time. Risk is often overlooked as the focus for investors is usually returns. It is not enough to evaluate a portfolio just by looking at returns if you do not have a clear understanding of what can be or was lost to earn those returns. All asset classes are likely to experience significant loss during an investors lifetime, so nothing is more important than understanding risk if you want to have a smooth ride.